To put a website on-to the Internet, you need to arrange for 'webhosting'. This is usually done by paying for the services of a webhost , who will provide you space-on and access-to, a computer (a web server) that is permanently connected to the Internet via a high-speed connection. This tutorial covers requirements for hosting Composr and some general information about webhosting and security. This tutorial goes into great detail of all the low-level requirements (much of which you may not understand), and different environments to install on. Practically speaking almost any "PHP hosting" will run Composr, so long as it's not free ad-supported hosting. The verbosity of this tutorial is so that we can be really comprehensive. A simpler list is shown on the Composr download page. Google App Engine, which is a special case of PaaS due to the high-level of organisation you need to work within. It is covered in its own tutorial. 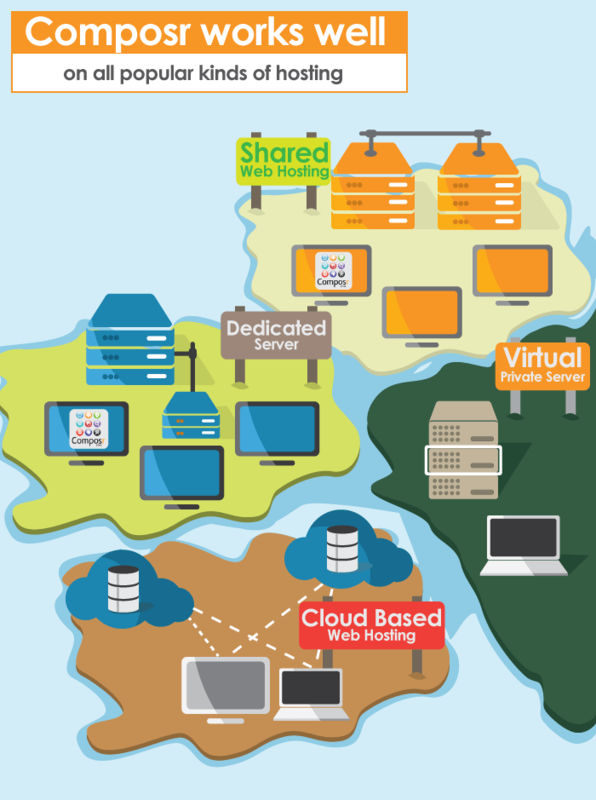 The vast majority of users will choose traditional shared webhosting, or traditional VPS webhosting with a control panel. Users with high requirements for CPU, memory, security, privacy, autonomy or disk space, may opt to get a dedicated server . This is more expensive, and usually requires additional maintenance by the user, but for some users, is highly advisable. Programmers will often prefer IaaS and PaaS hosting in order to get scalability. However scalability is not automatic with any system, so programmers need to put serious consideration into infrastructure. This is discussed more in the Optimising Performance tutorial. Regardless of your choice, you'll always be running the same underlying software (PHP etc). For the purpose of this tutorial the differences don't really matter, except where we provide specific advice on configuring platforms. We have various different installation tutorials that go into details on how to install on the different hosting options. We don't currently recommend any particular webhosts because it is a tricky thing. I'm afraid the answer will be rather cynical, but I want you to get a realistic outlook. Webhosts have a tendency to take a turn for the worse at some point, as it's a race-to-the-bottom kind of industry – any ones built on a good reputation tend to get taken over when the founders cash-out and then milked for it by a new team. We advise picking your own webhost based on good reviews that are both recent and credible. Actively look for people complaining about the company to get a sense for whether these complaints are reveal a pattern of genuine concern (as opposed to general frustration with technology / unreasonable expectations from the webhost). Don't pick the cheapest, but also don't assume paying more guarantees good service. Keep making sure you have your own backups so that you are able to always make a swift move if it becomes necessary. When choosing a webhost, you need to make sure that they meet all the requirements of Composr. Composr is intentionally designed to have very low requirements, but like when making virtually any choice in life, there are various different kinds of product that companies may try and sell. If a random commercial PHP /MySQL -supporting webhost was chosen, it is very likely that they would support these requirements: however the developers cannot be held accountable for incompatibilities with systems that do not. The remainder of this section details Composr's requirements. If you have trouble ascertaining a webhosts compliance, you may wish to contact them with this information. Easy-reference summary of the key hosting recommendations. GD2 extension (including PNG and JPEG support). GD is used by PHP for image generation, e.g. to generate thumbnails. no other explicit disabling of standard functionality that we require. Commonly webhosts do this using ModSecurity, Suhosin, suPHP or their own modified PHP versions. We do our best to workaround such issues for common recoverable cases, but ultimately if arbitrary standard functionality has been disabled the software cannot function. memory limit of at least 32MB (bare minimum – you may see errors if caches are disabled, while caches fill, if you are doing imports, if you are doing Admin Zone searches, or if you are a programmer with dev mode on). MySQL is the database software (software which allows creation of a number of separate databases) which Composr uses to store the majority of its data. Often webhosts will quote a number of databases that webhosting comes with: Composr only requires a single MySQL database to function. At least 5MB of database storage space is required, which should be available on any reputable webhost. The max_allowed_packet server system setting must be at least 16M. (*) Other database software may work, but is not supported. MariaDB should work as a drop-in MySQL replacement but we do not proactively test against it. Certain permissions are required as described in the Basic Installation tutorial. (†) MySQL 5.5.3 introduces the utf8mb4 character set, which is required to store emojis. The installer assumes you will install with this support available, but upgrades from older versions may work in anything from MySQL 4.1+ if the database is kept in latin1 via having $SITE_INFO['database_charset'] = 'latin1'; in _config.php. This compatibility will not be guaranteed, but as webhosts have been very slow to upgrade MySQL installations we will informally try and maintain it. FreeType (with the build-option for GD). FreeType allows us to draw text onto graphics using TrueType fonts. If you want automatic thumbnail generation and transcoding you need a server with FFMPEG on it. It must be accessible via PHP either via the PHP extension (thumbnails only, not transcoding), or the ability for shell_exec to run from PHP (both thumbnails and transcoding). It is best, however, to transcode manually offline/off-server to avoid resource over-use. Do not try and install Composr on an ad-sponsored free webhost. The banners and tracking they inject will interfere with the mechanisms of Composr. If LDAP integration is required (for corporate network authentication integration), the PHP LDAP extension is required. If you need to be able to easily remove 'bounce' e-mails from newsletter subscriber lists, you will need the PHP IMAP extension. If your IMAP server requires SSL (like gmail) then you will need to have IMAP-SSL support inside PHP (or you will get "invalid remote specification" errors). If encrypted CPFs (custom profile fields) are needed (see the Advanced Composr member system tutorial), or Composr-fed DKIM, the PHP OpenSSL extension is required. This section contains some suggestions for which packages to install on different Linux distributions to get a good PHP environment. It is only applicable to people who aren't on traditional hosting with a control panel to manage things from. This section is not actively maintained. Package names may change, but it is designed to give a leg-up to people configuring new Linux servers. ; extension_dir = "./" → extension_dir = "usr/lib/php5/20121212"
You may need to setup the EPEL repository first. You may also want to include yum-cron (or whatever it is now) in there, for automatic system updates (who has time to stay on top of all server software for urgent security patches?). Composr is only tested on, and optimised for, Apache and IIS. However in principle it should work on any web server software. There are a few notes to give, although the only one of likely major significance is the URL Schemes one.. In terms of operating system support, Composr is only tested on, and optimised for, Windows, Mac, and Linux. It may work on other operating systems supporting by PHP, such as BSD variants – so long as they are Unix-like. If your forum is not on the list, professional developers are available to add support. Please note that many 'forum systems' are referred to as 'bulletin boards', and that a 'forum' within 'forums' is often referred to as a 'board'. We consistently use the terms 'discussion forums', 'forums' and 'forum' to describe these. We also provide converters for most of the above to our forum system, Conversr. If you currently use one of these systems, you have the option to convert it. Instead of naming the forum "Website comment topics" or "Website Support Tickets", you could name it "Mysite comment hub", "Mysite help region", or anything else you choose. Just be sure to change the configuration option to reflect it. This is in the "Support Tickets" and "User interaction" groups of the "Feature Options" configuration category. Find this under Admin Zone > Setup > Configuration. If you have installed forums, you will likely wish to create a comments forum. To do this, create a non-public forum called 'Website comment topics'. This forum will be used to store topics relating to comments for content in your portal. You may also wish to create a non-public forum called 'Website support tickets' if you wish to enable the support ticket feature. Server variables may be set in the MySQL config – either the main config file (e.g. /etc/my.cnf), or included files (e.g. from /etc/my.cnf.d) – or in the startup parameters – or via setting the server variable at run-time. If they are not set anywhere then MySQL will use hard-coded defaults. If it is, you'll see it in the command. This may be set in an init file such as /etc/init.d/mysqld, but it varies considerably by Linux distribution. Again it varies a lot by distribution. On Windows you'd use the Services application to restart the service. When a MySQL session is started, certain server variables are cloned into the session (e.g. max_allowed_packet). These variables may then be read and written as either server or session variables (actually max_allowed_packet is read-only as a session variable – an exception described further below). If you set a global variable then the current session is not affected, but new sessions will be. Sessions are thrown out when connections are closed, e.g. when a Composr page is fully served. "Session" = "Local" = "Connection"
The rest of this section will deal with the specifics of the max_allowed_packet setting, which is the only variable that a server administrator usually needs to set. max_allowed_packet exists as separate server-side and client-side settings; this is totally different from the concept of server and session variables (which are both server-side) and should not be confused. max_allowed_packet defaults to 1MB server-side if not configured at all (i.e. this is the hard-coded default). Most web hosts will have a higher default value and Composr defines a minimum requirement of 16MB (we define a higher limit in case large Comcode pages are being cached). max_allowed_packet's session variable exists but is read-only. Attempts to change it will give an error message. You therefore must configure the server variable correctly. Only MySQL users with the SUPER privilege may set the server variable. Typically only the root user has this. max_allowed_packet defaults to 1GB client-side (e.g. PHP), except in official client applications like mysql (16MB) and mysqldump (24MB) (which may be configured in the MySQL configuration, the client configuration sections). Therefore for the Composr application the client-side setting is irrelevant, but you may come up with it when doing MySQL dumps for example. max_allowed_packet can be set with "M" syntax, not just with exact bytes. So you can set it to 16M or 16777216, that's your choice. Once parsed MySQL will show it in bytes. The absolute maximum max_allowed_packet setting (both server-side and client-side, as it relates to the protocol implementation) is 1GB. Most websites prefer to have a short and memorable Internet address, direct to their front page. In order to achieve this, you will need to pay for control of a domain name. A very large number of companies will provide these domains, and the facility to bind these names to your web-server, for a very low fee. It is important to note that domain names are licensed on a temporary basis, and therefore you will need to renew your domain names. The length of the licence varies, but is typically between 1 and 5 years. Usually the webhost will take responsibility for the daily maintenance of the server. For example, keeping the server software, usually Linux and common Linux software, up to date with security and stability patches . However few webhosts will take serious responsibility for the maintenance (including backups) of your space on the server. If you are not using a traditional webhost then you probably are responsible for absolutely everything, so make sure you are comfortable with that. It is important to understand the responsibilities for the various aspects of creating, maintaining and operating your website, before you launch your endeavour. This allows you to manage your account on the server, and create databases, FTP accounts (additional to your primary account that already would exist), and e-mail addresses. Note: the next few paragraphs detail the complexities of a typical Linux file system, and is not necessary reading for most users. Of course this is only a partial detailing of the directory structure, but the intent is to provide you with an overview of what is really happening on your server. Usually you will not be able to, using your control panel or SFTP/FTP, see outside of '/home/your-account-name/'. When you install Composr, you usually would place the quick installer or manual installer files inside '/home/your-account-name/httpdocs/'; this is the directory that becomes accessible at the base URL of your website. For instance, if your account on the server was associated with a domain name, 'mywebsite.com', then http://mywebsite.com/index.php would be tied to the file system file, '/home/your-account-name/httpdocs/index.php' (often the 'www.' is removable, but not on all servers). In addition, from your main FTP account, the same file would likely be '/httpdocs/index.php'. As previously mentioned, this file system is merely illustrative. Different servers use different conventions; for example httpdocs is often public_html or www. With a shared user, all sites run code as a user such as apache or nobody. This is simpler for the host to configure, but it is not a good idea for security. It also is the reason so much 'chmodding' may be needed (so the shared user has write access to files specifically on your account). In this scenario they will typically then lock other things down, such as denying shell access and setting an open_basedir to sandbox PHP – but rarely are these restrictions enough and it's an inherently incorrect approach for a shared webhost to take. Different server users are likely to be able to access and interfere with (erase and edit) each others files. We strongly advise any webhosts to use a suEXEC-style environment. With a suEXEC-style hosting environment, sites run code under the same account that the site is held in. This is simpler, easier to configure, and more secure. "suEXEC" refers specifically to how the Apache server manages this, other server software will refer to it in different ways. Without suEXEC the web server will run under a web-server-specific user, such as apache or nobody. Let's assume the web server runs as apache, and your user account is bob. Any file created by the web server (or PHP) would be owned by apache. For example, Composr uploads, or Composr revision files. Any files you manually uploaded (e.g. via FTP) would be owned by bob. Both of these situations present a disparity in the permission scheme. If apache wants to write to a file you uploaded, it cannot, unless you specified world-write permissions on the file. This is why we talk about file permissions in our documentation, saying exactly what needs to be set. If you want to edit or delete a file made by the web server, using your FTP account, you cannot, unless the server had specified world-write permissions on the file. Fortunately Composr is quite smart and it actually does set world-write permissions on the apache owned files. It does this because it automatically detects the disparity between the account owner and the user the server is running as. Composr detects the account owner by seeing who owns the index.php file. 'PHP-info' displays information about the PHP server environment. This is based on a feature PHP itself provides, of the same name – but we also add in some extra checks of our own, putting out warnings if software requirements are not met. Information includes all the technical details of the PHP configuration, such as the installed PHP extensions and the defined options. 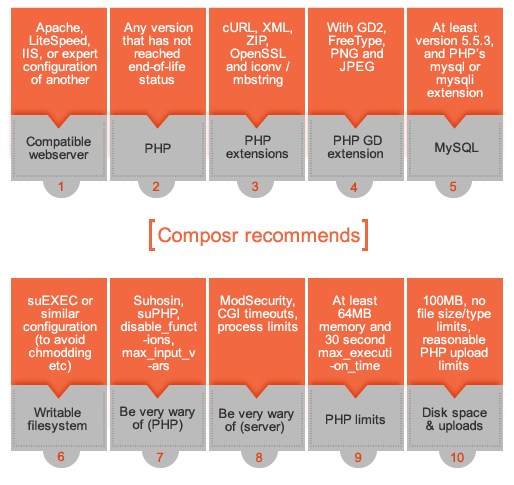 Some PHP options can be defined in the '.htaccess' file (Apache non-CGI web server users only), as illustrated by the default recommended.htaccess file. On CGI servers you need to use a custom php.ini file instead (see our FAQ). Full details of this are in the PHP manual. The PHP-info is also convenient for identifying wider factors of the system environment, such as server paths. However, it's still a great system because it lets your site content continue to be available even under massive load. Failover can automatically fall into place based on a number of criteria. Note that the failover status messages (failover_message_place_after and failover_message_place_before options) are put in place at the caching stage, not dynamically. So you would need to empty the static cache if you change these messages to something else. Failover mode requires the PHP usleep function not be disabled. Infrastructure as a service. This is cloud hosting based on direct provision of VPSs. Platform as a service. This is cloud hosting based on providing direct support and configurability for particular programming language(s). It typically will hide the complexities of VPS management from you. Software as a service. This is what you are using when you create something like a Facebook page or a hosted blog, where you don't ever need to directly install/configure the software. This has advantages but severely limits configurability. Composr could be delivered as SaaS but the majority of users want a high degree of control over their sites. Hosting managed via a webhost. Support is provided, servers are kept up-to-date, and control panels are provided for relatively easy system management.